When you’re trying to get your mutual fund off the ground or need some new leads, the different types of marketing options available to you may be a bit overwhelming. Where are you supposed to begin? At Havener Capital Partners, our third party marketing team believes in the power of blogging. It’s a great place to start your marketing efforts, pull traffic to your website resulting in more qualified leads, and get your undiscovered mutual fund on the map. It’s not enough, though, to set up a blog and then write whenever the mood strikes you. You should be blogging on a regular basis—once a week (at minimum) is an achievable goal to begin with—in order to reap the benefits of driving visitors to your website. And more visitors = more potential leads. Every blog post is another opportunity for a lead: For businesses without a blog, they have to hope that someone comes across their website during a Google search. 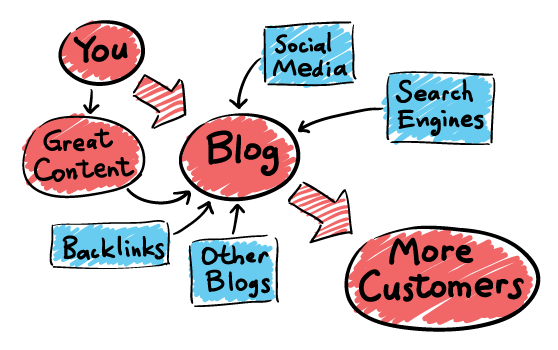 But with a blog post, you control the content (and keywords) and therefore, increase your chances of being found on a google search. Every time you hit “publish” on a blog post, you’re putting out another branded piece of content that a possible lead could use to find you. The proof is in the pudding: B2B marketers that use blogs receive 67% more leads than those who do not. Blogging regularly tells Google to keep you on their radar: Search Engine Optimization (SEO) is a big component of creating a successful online presence, and part of that is faithfully publishing quality blogs. Once you get on a regular schedule, Google will begin to notice your website is active and they will crawl your site (and blog) more frequently to index new pages. Indexed pages will show up higher (closer to the top) on a search result. Your social media game will soar to new heights: Do you struggle with deciding what you should be posting about on LinkedIn, Facebook, Twitter or Instagram? Blogs give you instant content to share with all of your followers—who will hopefully share with their network, and ultimately helps to get the word out about your mutual fund. In addition to entertaining your followers and hopefully getting discovered, posting links to your blogs on social media will also drive traffic to your website. Best case scenario? Some of that traffic turns into leads. Worst case? People visiting your site is another clue to Google that you’re worth a higher ranking for certain keywords. Establish yourself as an authority: When you’re trying to get the name of your company or fund out there, blogs are an effective way to communicate what you know. You’re not running a paid ad telling everyone how good you are at what you do—you’re giving away free content that that might provide a solution to someone who is searching for just what you have to offer. If you haven’t started blogging for your mutual fund yet, don’t hesitate to jump in and get started. Marketers who have prioritized blogging are 13 times more likely to enjoy positive ROI, so what are you waiting for? Sold on the benefits of blogging, but not really into the whole marketing or writing side of things? Havener Capital Partners has your back. Contact us to learn more about how our third party marketing team develops content for full marketing campaigns, websites, blogs, and other eye-catching pieces of marketing collateral, and can also help promote them. Paige Blankenship is the Director of Marketing at Havener Capital Partners. She is responsible for overseeing creative, branding and marketing efforts for Havener’s clients as well as the firm. Paige makes fact sheets look stylish, combines flair with content on websites, and gives visual representation to the things that make a firm unique.